I have a nice leather handbag that was a gift from my hubby. Lovely tan leather but the insides were a shoddy lining that frayed horribly at the seams, split open in multiple places (seams were all unfinished on the inside) and I was forever losing handbag contents in between the lining and the outside. Not to mention how grotty it was all getting. So I bit the bullet and relined the bag, adding in a couple more zippered pockets to the interior which I find more practical than pockets. I was expecting to make a total mess of it but it was surprisingly easy – I cut out the old lining, used it as a rough pattern and made up a new interior using some nice cottom fabric – also a gift from one of the hubby’s Vietnam business trips. All the zippered pouches and pencil case gift-making experience came in super handy and I managed to construct the internal zippered pockets without too much trouble. I then slip stitched by hand the lining to the original stitching, which feels very secure and also relatively easy to remove should I ever feel the need to do this again. So some quick pictures on my phone just to document it. Super practical sewing but as I use this bag every day it I get a thrill now when I see the new and vastly improved interior. I only have some dodgy phone selfies for this at the moment but the fitting adjustments worked well the second time round so I am ready to cut into my nice jersey crepe for this pattern. Oh, and the back bow/collar detail? Thats called cutting the neck bands out of the back pattern piece and the patch up job turning out surprisingly looking like I meant to do it. And a bow, because the back seam does not neet exactly lined up just for fun. Instead of the collar I cut a long binding piece and ran it the whole way round the neckline. I used a hem binding as it was a tad short but I didn’t have enough fabric to make it longer. For something I was just whacking together to test fit it turned out very wearable. And yayy. 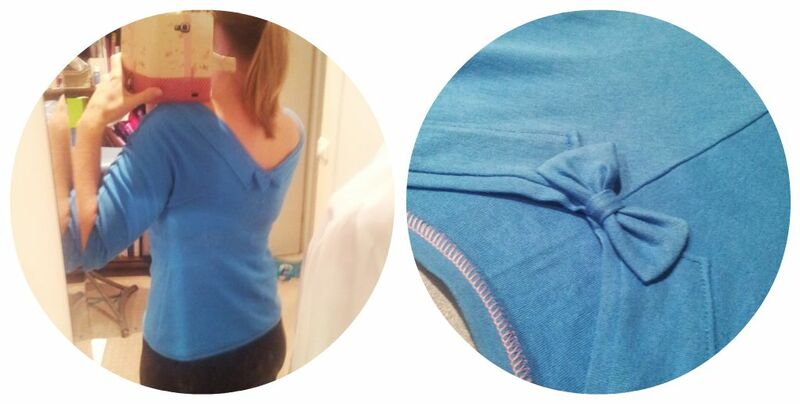 I’m excited about the fitting success for this type of top, as I have never got them sitting/feeling right before. Win!